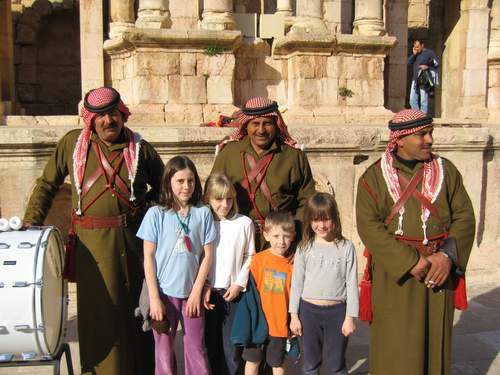 Diary I love Jordan and the Jordanians. You would be hard pressed to meet a nicer group of people. We were chased by a guy in 4X4 desperate to stop us and tell us of his wonderful time studying in beautiful Huddersfield – is it the same one I know? The kids still seem to be enjoying themselves although we get the odd ‘crumbly’ rebellion …” not another castle!” They seem more than happy to treat ancient Roman ruins as some type of giant adventure playground. Nye has been appointed official health and safety officer, a title he has coveted since he saw Ed at St Saviours Nursery with his clipboard and fluorescent jacket. There is plenty for him to comment on (driving the wrong way down motorways, ten people in a car…no seatbelts, ignoring red lightsetc) – he is the cautious one in the family…Ella on the other hand pushes the bounds of safety to the limt and takes great delight in making us wince with death defying feats. I’m sure my hair will be totally grey by the end of this trip.